So it has taken me a long time to buy water beads because they are not edible and I know they will look tasty to my little guy who is 1.5 (try edible water beads as a safe alternative if your kiddo is like mine). Curiosity finally got the best of me and I ordered 5 packets for a little over $1.00 each from Amazon. I was super disappointed when they arrived because they where so tiny, but I soon found out that their small size is very deceiving and my kiddo and I have been missing out. Water beads are an amazing sensory experience! Ms. Tiger has been captivated by them and I know this is the first of many water bead activities. 1. Soak water beads in water. This is a plan ahead activity because the package we bought said to soak for 4 hours. I was shocked the first time I read the package and had to post-pone our activity for the next day. 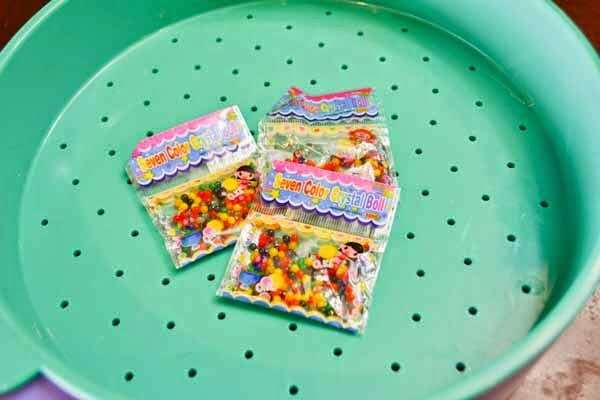 Here are the 3 packages of water beads that we used. Water beads starting to soak-notice how small they are. 4 hours later we came home to this. Ms. Tiger was shocked as was I. Look how big the water beads got. 2. Let kiddo separate water beads by color. Then add some matching food coloring to each bowl. I let Ms. Tiger squirt water into the bowls and then mix the water and food coloring up with a spoon. You may want to prepare the colored water yourself before the activity. Then you can have kiddo separate beads into the prepped water. The colored water beads blend into the colored water, but they didn’t disappear completely like the clear water beads did. I still think the activity was fun and successful! I was impressed by Ms. Tiger’s sorting skills and fine motor control. Look at the concentration it takes to separate the water beads into the correct bowls. She also used her fingers and found it fun to squeeze the slippery water beads. We have spent hours now playing with the same water beads. I just store them in the fridge in an air tight container full of water. If they sit out in the air they shrink back to their original size. Then if you place them back in water they expand again. (I only did this with a couple of them, I am not sure if a whole bowl full would start sticking together). see all our Sensory Play Activities here. I have done this at home for my little girl and she has always enjoyed sorting. We used a net filter to remove the beads from the water. Stepping in from wow weekends linky. I had never heard of water beads, but this looks like a fun activity for young children! Stopping by from the Mommy Monday Blog Hop. I've never heard of these before! They sound really neat! Love this activity! I have been searching for water beads but didn't know which to order. I'll use your link and order some now. Thanks. Hi Kristen, thanks so much for visiting and for ordering using my link. I appreciate the support and hope you and your kiddos have fun! They are amazing, I totally think everyone should play with them at least once 🙂 Thanks for visiting,, have a great day! Water beads are amazing for sensory play! I am glad you had fun with them. I've been avoiding them because of the tiny thing in their mouth fear too – looks like I better go out and buy some!